Okay, here's the last post for today. I ordered them so you could just scroll down to read each one as they build on one another. Enjoy! Scatterbrained Betty Barrett mistakes masseur Jack Spratt for Jose O'Rourke, the captain of the South American polo team. Spratt goes along with the charade, but the situation becomes more complicated when they fall in love. Meanwhile, Betty's sensible older sister Eve fears Betty's heart will be broken when Jose returns to South America. She arranges to meet with the real O'Rourke and love soon blossoms between them as well. (Taken from IMDb). I love this movie so all the fantastic fashion is just icing on the cake. What I love most about this film, is to a certain degree, we see what goes on behind the scenes in the fashion world (see first image). Eve is shown sketching designs and even takes us the viewer into the factory where the swimsuits are made. All of the films for today receive a grade of 9 or above (which I didn't take the time to mark down in the two posts above) and I really feel that's due to their plot circling around the fashion world. How could Hollywood present a movie about fashion designers without having a well dressed cast? I have already done a post on Irene, giving her background and such; so if you are interested, click HERE to be directed to that post. Irene is amazing. I am sure I say that about many of the fashion/costume designers I feature on here, but I truly feel that way. 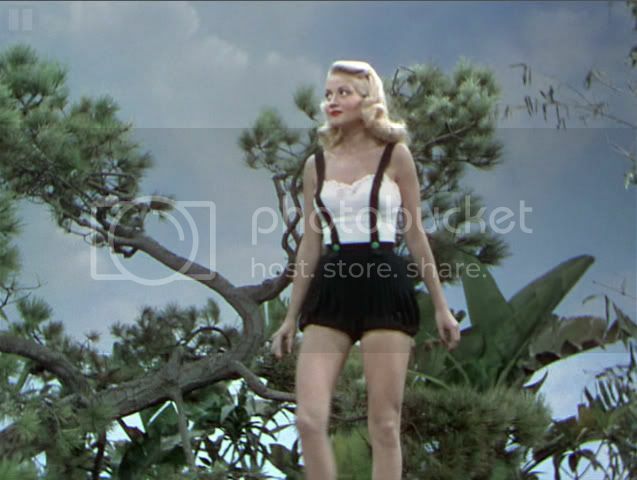 I try to pluck out films that were worked on by designers other than Edith Head and the like. Don't get me wrong, Head is great, but I feel so are some of her contemporaries as well. I chose this film to wrap up the posts for today because it combines the ideas found in the other two films selected for today, but does so in a slightly different way. The fashion show sequence in this film is less integrated into the narrative. While we have the two audiences present, we do not see them during the sequence, the spectator sitting in the theatre seat is being directly addressed full on for the duration of the show. So, while the show is part of the narrative, it is presented to us the viewer in a slightly different manner. We also get the posing that is present in the other two films, but the models are not on a runway and more than one model is present at a given time or is alluded to, because there are all assumed to be on the same rock. I think this sequence presents many of the same ideas as the other two do. The swimsuits are being put on display for the viewer and might influence them to go out and purchase something similar because of this movie. We also can find traces of how these swimsuits might make one feel: like a glamour girl or a pin-up. 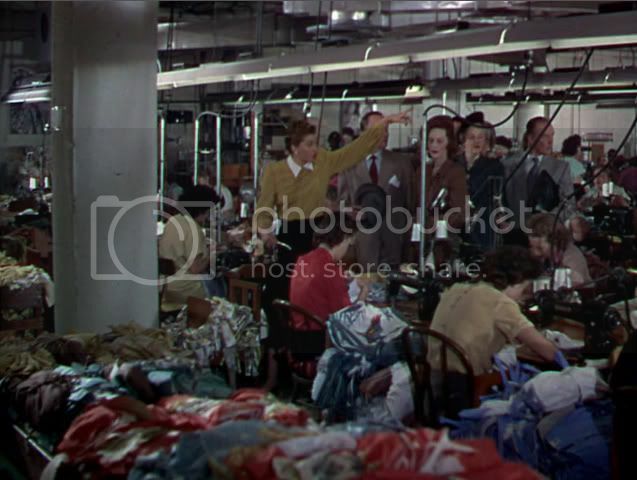 This film is an example example of the idea of "soft promotion," where the fashion show sequence is used as a way to promote clothing sales. 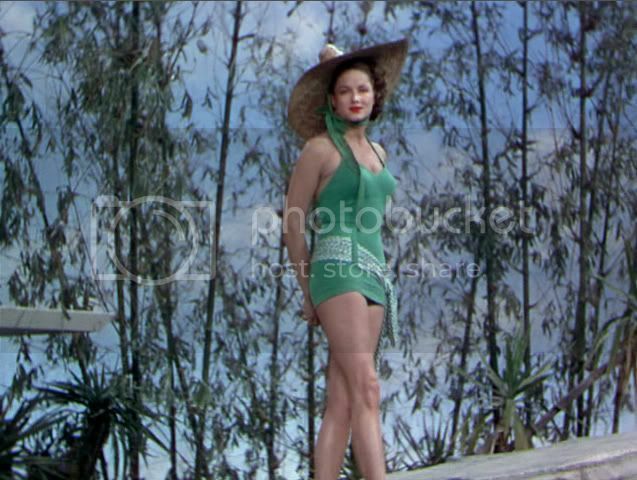 This film also "teaches" women how to behave in swimwear, walking gracefully and posing in a slightly seductive manner, possibly in an effort to display one's best assets. However you feel about what these fashion show sequences seek to achieve, I think we can all agree that they are excellent documents of fashion history, giving us vintage gals some spectacular eye candy and fashion inspiration. Neptune's Daughter is available on DVD and for rental through many services. I confess I misread the title of your post, "Fashion Show February: Neptune's Daughter," when it showed up on my blog roll. I had just been watching The Neptune Factor on cable -- a cheesy 1973 action flick involving a deep water rescue mission -- and I thought, "What?! Ernest Borgnine in a wetsuit? Is she crazy?" Haven't seen this one--it's going on my Netflix queue right now! Max Dirt Bike Download Softpedia. Max Dirt Bike : Free Download. Your objective in this physics bike game is to ride your dirt bike over all. because some mirrors may require that you do not block. Dirt Bike. Additional Information: Balance is key in dirt bike. A good place to start at online casinos are Free Casino offers Play best Free Casino Games. No downloads, activeX or pop-ups. Dirt Bike 3 flash games GamePuma.com. Dirt Bike 3 flash game Over 6000 free online games and adding new fun games every day! The game to improve your patience and activeness? If “yes” than here you are with the ideal platform to enjoy your play time with the more exciting match,Knife Hit game online. Thanks a lot. Very useful post on wonderful ideas. It would be really helpful.